If you've never counted calories or macros before, here's a crash course in it. If you want to work with me, it is important to understand how to count calories and macros. This FAQ should answer any questions you have. Some of the information in this FAQ has been adapted from my friend Andy Morgan's macro counting rules. An awareness tool. Much like stepping on the scale and weighing yourself on a regular basis, counting calories and macros helps you develop an awareness of how much and what type of foods you are eating. Counting calories/macros is essentially a form of self-monitoring, and self-monitoring has been shown to be an important component of fat loss success. A tracking/diagnostic/adjustment tool. As your coach, the more information I have, the better I can help you succeed. Since nutrition is at least half of the fat loss or muscle gain battle, it's important that I know your calorie and macronutrient breakdowns. It will help me diagnose where problems may lie, and make adjustments to your dietary strategies when necessary. What Tools Can I Use to Count Macros? You will also want to obtain an electronic food scale, which can be found for as little as $10 on Amazon. What Do I Look For on Food Labels? 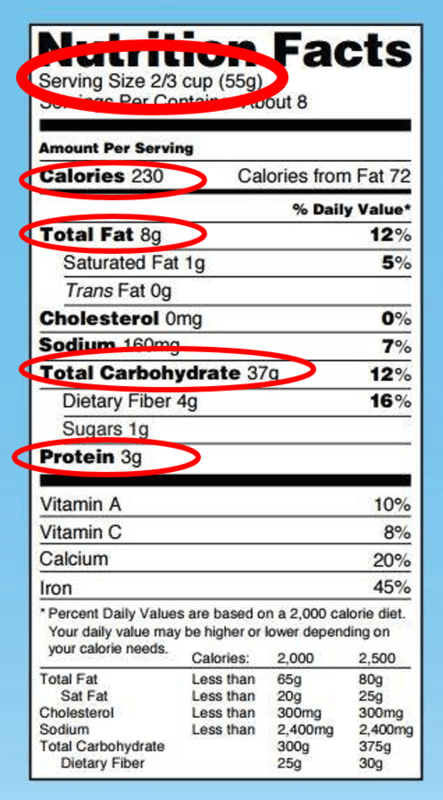 The following picture is an example of a U.S. food label. I've circled the components that we are counting. It is important to pay attention to the serving size; in this example, the values you see are for 2/3 of a cup of this particular food. Is There A Hierarchy of Importance for Macros? Yes. Calories are the most important. The bottom line is, if you want to lose fat, the best training program in the world isn't going to help if you are not in a calorie deficit (you are expending more energy than you are taking in). It is total calorie intake, in relation to calorie expenditure (how much you are burning each day), that ultimately determines whether your weight goes up, down, or remains stable. Protein is the next most important component. Protein helps build muscle. It helps keep you feel fuller if you are on a diet. It helps you maintain muscle while you are losing fat on a diet. This is why I always set calories and protein first for myself and for my clients. Carbohydrates and fat will then make up the remainder of your calorie intake. The proportion of each is largely a matter of your overall training volume and personal preference. The more you train, the more carbs you will need at the expense of fat. I tend to favor a higher carb and lower fat intake for most clients simply because fat is very energy dense, and it is easier to overeat on it compared to carbs. Still, it will depend upon what you can consistently adhere to, and adherence and consistency are by far the best predictors of success. What If The Food I Eat Doesn't Have A Label? Many foods that you eat will not have labels (such as fresh fruits and vegetables). However, many of the tracking websites and nutritional calculators I mentioned earlier have thousands and thousands of common food items in their databases. When you type in the food, the calorie and macro information should pop up. There are also ways to simplify the counting process which I mention further down. Do I Need to Obsessively Weigh Every Ounce of Food I Eat? No, you don't need to weigh every single ounce of food you put in your mouth. For example, fibrous vegetables (green, leafy vegetables, or vegetables like broccoli) contain very few calories and you can be fine without weighing and measuring them. If you're just starting out, I recommend weighing and measuring most (if not all) foods just so that you can get an understanding of true portion sizes and the energy/macronutrient content of various foods. As time goes on, you will get better and better at estimating portions without weighing and measuring. Constantly weighing all foods is not a sustainable or healthy practice over a long period of time. Rather, it's something to help you get yourself on target and establish consistency. The goal is self-monitoring, not self-obsession. The level of accuracy you need is dependent on your goals. The leaner you want to get, the more precise you want to be. If you are overweight and just trying to get in shape, you have much more leeway then if you are trying to get ripped. I recommend shooting for 10% of either side of your macro targets each day, 90% of the time (just make sure you aren't binge eating the other 10% of the time). If you are looking to be in the single digits for body fat percentage and are prepping for a contest or photo shoot, then I recommend 5% on either side. Keep in mind, however, that it's impossible to be 100% precise. Foods naturally vary in their calorie/macronutrient content from what might be listed on a label or food database, and there will always be human error in estimating portion sizes. However, this error will even out over time if you are consistent in the way that you count. The idea is that we don't want to have huge errors or variances day to day. Do I Have to Count to Be Successful? No, you can successfully lose fat without counting. There are various techniques you can use to lose fat without counting (my friend Mario Tomic talks about some here). However, as a coach, it will be important to count macros when working with me so that I can make assessments and adjustments where necessary. Do I Need To Count Calories & Macros Forever? No, obsessive and constant counting calories and macros is not a healthy or sustainable long term approach for most people. Again, counting macros is a self-awareness and feedback tool. It is a tool to get an idea of where you are at. What Are Common Errors People Make When Counting? The biggest mistakes that people make when counting is not correctly assessing portion sizes, and not considering the amount of energy that fat can add to the diet. For example, 2 tablespoons of peanut butter is 190 calories. Many people will scoop out big rounded tablespoons (which in fact will be more than 2 tablespoons), which can quickly lead to double the calories they think that they're eating. Or, people will not count the dressing that was on their salad. Extra calories can sneak their way into your diet in a lot of ways and it's important to be aware. Can I Eat Whatever I Want If It Fits My Targets? Theoretically, you can. However, practically and realistically, this is difficult. For example, energy dense or highly processed foods may not be as satiating as whole, unprocessed foods. If you are trying to eat in a sustainable calorie deficit, it can be challenging to stick with it if you are not feeling satiated. This is not to say there isn't room for your favorite foods in your nutrition program. Click here to learn more about flexible dieting. Eating out occasionally certainly can be incorporated into a flexible dieting program. Some restaurants provide calorie and macronutrient information, and many of the online trackers I mentioned earlier will include such information for certain chain restaurants in their databases. However, the true calorie content on some restaurant menu items may be significantly higher than what is reported. Also, many restaurants don't provide any calorie/macro information at all, and restaurant items can have hidden fat (such as added butter during cooking) that can dramatically increase the calorie content. Thus, if you want to work with me, it is important that you limit the amount you eat out. If you're eating out all of the time, it can make it very difficult to be successful since it can be nearly impossible to know how much you're truly eating. You don't need to count fresh, non-starchy, fibrous vegetables and green leafy vegetables. Their energy density is so low that they will hardly make an impact on your overall calorie/macronutrient intake, and you get the added bonus of them helping you feel fuller. For example, 100 grams of raw spinach only has 20 calories. Compare that to 100 grams of butter, which is 900 calories! It's really hard to overdo it on non-starchy vegetables. However, you do want to count starchy vegetables since they are more energy dense. Examples are carrots, peas, corn, potatoes, and parsnips. Are There Ways To Simplify the Counting Process? Cooked pasta typically weighs 2-3 times the amount of dried pasta, depending on the type of pasta. You can experiment by weighing the pasta before and after cooking. Canned or packaged fruits may have syrup or added sugar. Use the food label for these. There aren't simple ways to count fat. It is best to use online tools and food labels for getting the fat content of foods. Since fat is very energy dense (9 calories per gram, which is over twice that of protein and carbs), fat calories can add up very quickly. Eyeballing fat measurements doesn't work well, either. For example, 2 tablespoons of peanut butter has 190 calories, most of which is from fat. If you eyeball 2 tablespoons, you could have as much as 3 or 4 tablespoons instead, which can be 300-400 calories. Also, whether your tablespoons are rounded or not will make a big difference. Thus, try to weigh it whenever possible. Where Can I Find Out More Info on Counting Macros? There's a lot more info that can be found on the web on counting macros with a simple Google or Bing search. Thank you for the mention James!